Welcome back to The Last Cafe at the End of the Internet. I’ve briefly come back from a summer hiatus to sit down and talk with Camille Picott, author of Undead Ultra. 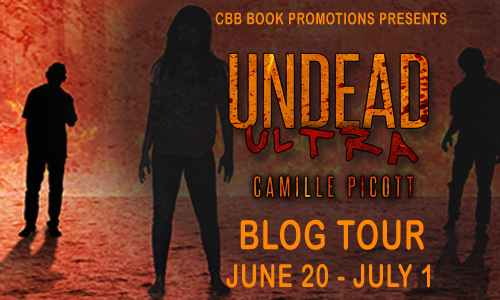 Welcome to my tour stop for Undead Ultra (A Zombie Novel) by Camille Picott! This is an adult post apocalyptic horror novel and the tour runs June 20 through July 1st with reviews, interviews and excerpts. Check out the tour page for the full schedule! Undead: a reanimated corpse with a craving for human flesh. Ultramarathon: any footrace longer than a traditional marathon (26.2 miles). For ultrarunners Kate and Frederico, a typical Saturday morning is spent pounding out a twenty- to thirty-mile “fun run.” It’s during one of their runs that an insidious illness descends upon northern California, turning humans into flesh-shredding zombies. When Kate receives a desperate call from her son, Carter, she and Frederico flee their hometown and set out to help him. The only problem? Carter attends college over two hundred miles away and the freeways—clogged with car wrecks, zombies, and government blockades—are impassable. Running back roads and railroad tracks becomes their only means of travel, but neither of them has ever run so far before. As pain, injuries, hunger, and fatigue plague them, getting to Carter and staying alive seem impossible. It’s either outrun the undead or become one of them, and for Kate, death is not an option. Camille Picott has been writing novels since she was twelve. 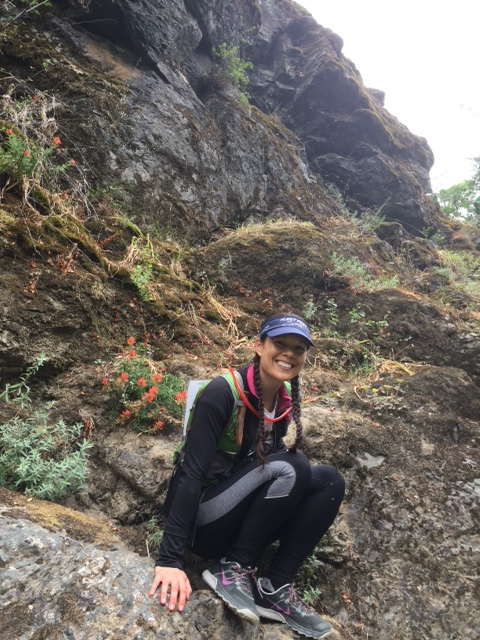 When she’s not working on a book, spending time with family, or whipping up a new vegetarian meal, you can find her trail running in Sonoma County, California. Astounding Books (AB): Camille, thank you for joining us today. 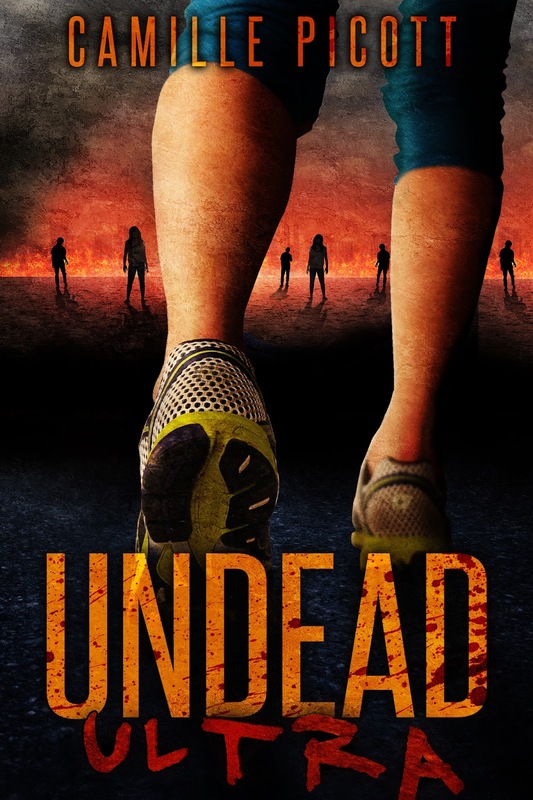 Your novel combines zombies, a post-apocalyptic setting and trail-running! What draws you to this particular genre? Camille Picott (CP): I love the “what if” factor in zombie and post-apocalypse novels. These types of novels have a way of feeling like they could be our reality tomorrow. I like to see how everyday people handle a new paradigm. AB: What’s up next for you? CP: To celebrate the release of my novel, I rounded up 14 people to run 200+ miles from Geyserville to Arcata – the same route the characters run in the book. We just finished the run last weekend. It was an amazing adventure! I’m working on a short film to document it. AB: What was your favorite novel as a kid/teen? Why? CP: I was a huge fan of a series called The Secret of the Unicorn Queen. A modern teenage girl fell through an inter-dimensional portal and ended up in a magical world with wizards, sorceresses, and unicorns. The main character, Shelia, joined a band of female warriors who rode unicorns and battled an evil wizard. What’s not to love about that? AB: What was the first thing you wrote that you were either most proud of or remember? CP: I had a panda bear stamp as a kid. I wrote little short stories about the panda and illustrated them using the stamp. AB: If you could hang out with one of your characters who would it be and what would you do? CP: I would definitely want to hang out with Kate and Frederico in Undead Ultra, preferably on a long trail run! AB: We all have a favorite place to write. Where is yours? CP: In my bed! We bought a fancy one that inclines and it’s super comfy! CP: Besides writing novels? Running lots and lots. Cooking. Hanging out with my family. AB: I was correct! What TV show or Movie are you currently obsessed with? CP: The Walking Dead and Tiny House Hunters. I have fantasies of moving into a tiny house so I can afford to write full time. AB: What was your Favorite Toy as a child/teen? AB: Go to your fridge. Open the door. What will you find? CP: I make smoothies every morning for breakfast. There are always at least 2 vegetables in them. This week, you’d find bok choy, cabbage, and kale in my fridge. You’re also likely to find celery, cucumber, collard greens (obsessed with these), cauliflower, and broccoli. The more veggies, the better! AB: Who do you bounce ideas off of? AB: Cats, Dogs, Fish or other? CP: I’m assuming you mean for pets?? LOL. I’m a vegetarian and a cat lover! AB: What Books are you reading at present? CP: End of Days by Susan Ee. CP: My Life As a White Trash Zombie, Zombie Rules, and Patient Zero. AB: I sense a theme here… At what point did you officially look at yourself as a writer? CP: When I self-published my first book, Raggedy Chan. I had published short stories in various magazines before then, but holding a printed book in my hands for the first time was really life changing and affirming. CP: Dessert. Lots of it, often. AB: Finally, the most important question: Is Pluto a Planet? Camille, thank you for taking the time to sit down with us today. Good luck on your novel, Undead Ultra. Prizing is provided by the author, hosts are not responsible. Must be 13 or older to enter and have parental permission if under 18. Void where prohibited by law. No purchase necessary to win. This event was organized by CBB Book Promotions.